So, what was your favorite part of the weekend, Jonah? Was it going to the soccer tournament or sleeping over Grandma's house or eating at IHOP or riding your bike through the Memorial Day parade or going to the swim club or eating burgers in the backyard or biking through the woods with Daddy? I don't know. It was all good. You should write it all down in a diary, so you don't forget anything. Then Jonah slowly packaged up his backpack and slowly walked down the street for school. Tired and sore from the weekend's activity. I know how he feels. I'm slow and groggy this morning. I'm trying to remember all the things that I need to accomplish this week. Unlike Jo, I can identify the best part of the weekend. On Sunday night, after leaving the kids with my parents, we drove into the city for a fine meal at the Union Square Cafe to celebrate our 13th anniversary. The city was empty. No traffic on the bridge and plenty of street parking. We wandered around until we found a good place to have a drink before dinner. 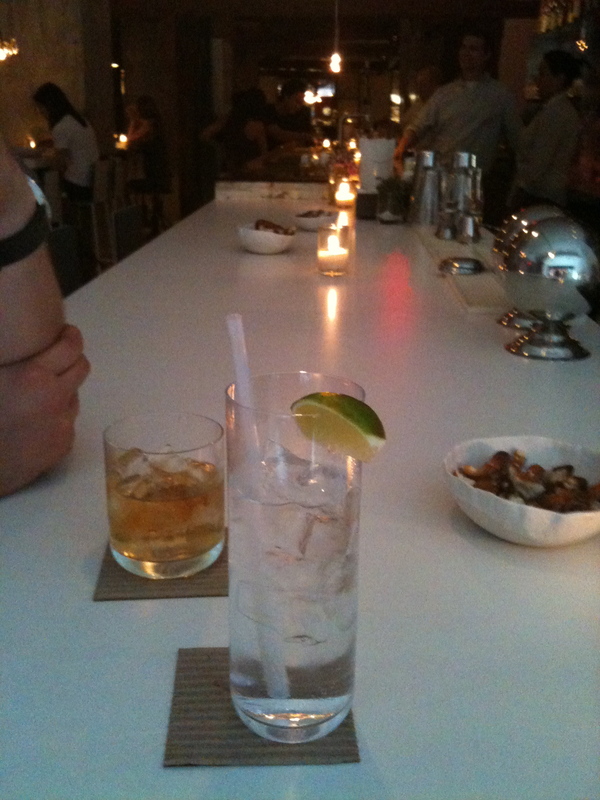 A cool gin and tonic at the ABC restaurant. We chatted with the bartender about rye. Steve has decided that he should drink rye whiskey because it's a regional drink. I think that rye is an old man drink, but the bartender said that it was growing in popularity. I showed Steve the latest apps and social networking gadgets. We checked into FourSquare and took pictures with Twitpic and put them up on Twitter. He indulged me and my toys. 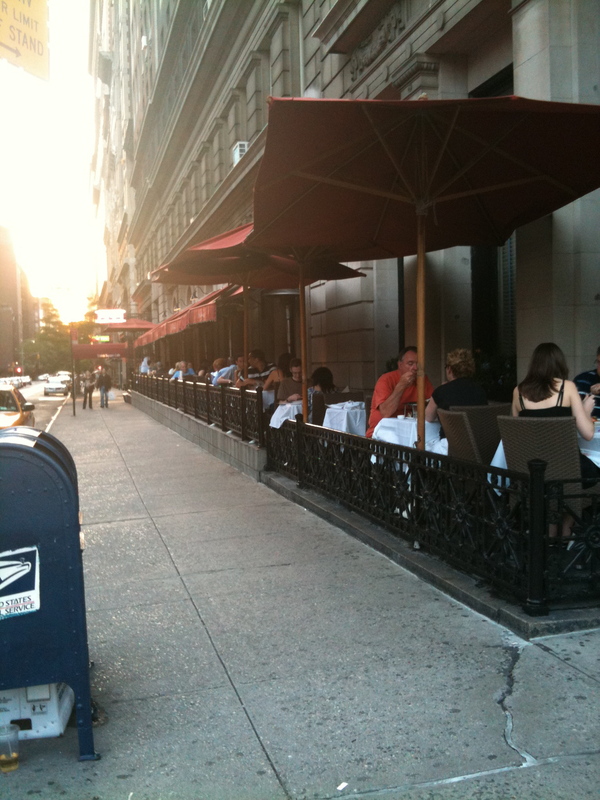 Then we went to Union Square Cafe for special meal. Frank Bruni had recommended the lamp chops and the potatoes au gratin, so that's what I had. 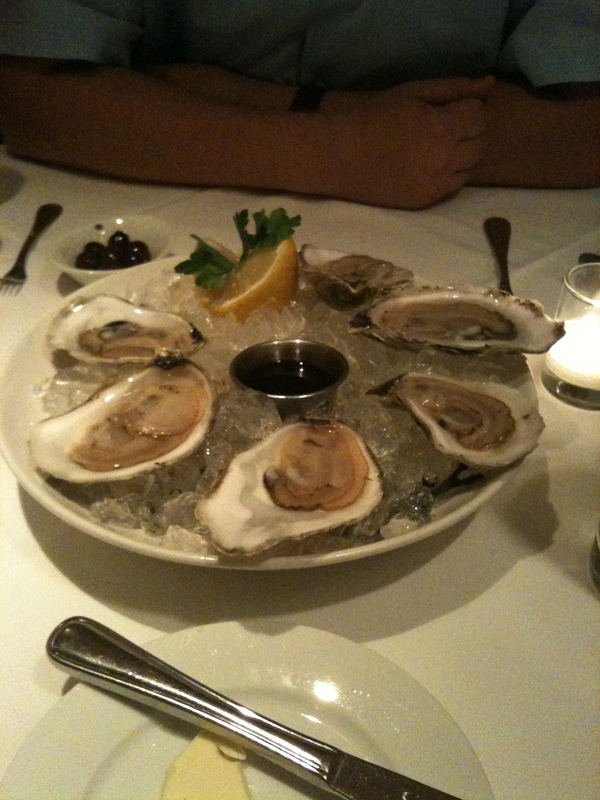 Steve had the oysters and the soft shell crab, deciding to ignore the gout for the evening. 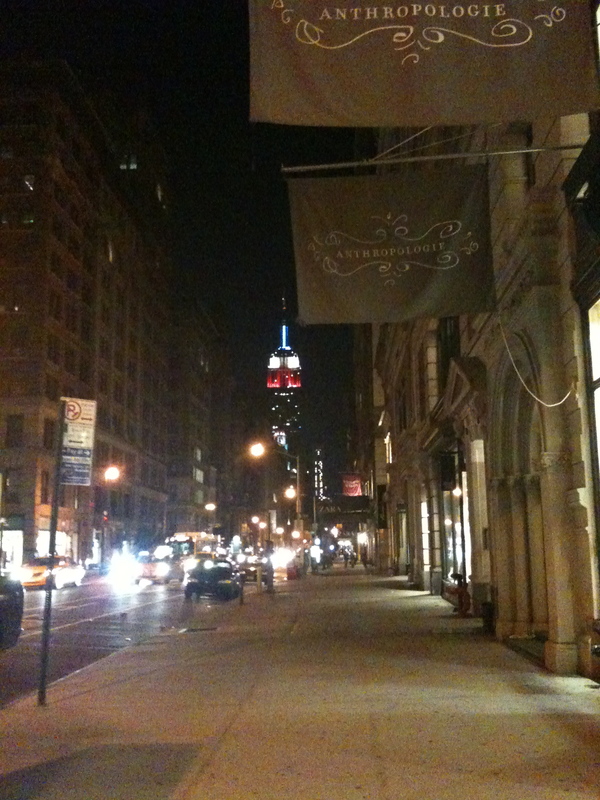 We held hands and took pictures of the Empire State Building dressed in red, white, and blue. It was a perfect city night. For over a year now, a small retail development near my house has had a sign that says “IHOP: Coming Spring 2010.” Those liars haven’t even broken ground. I’m assuming the recession made them thing twice (it killed plans for a hotel near me), but you think they’d take down the sign. In our part of the world, the kids have been out of school since last week. We’ve had some premature kid boredom and a grueling cafeteria closure to get through (cooking every night and 2 loads of dishes every day), but the cafeterias have reopened and one kid starts a camp on June 7th. We had a pretty thrilling trip to the grocery store this morning (cotton candy comes in a bag–who knew!!!) and the less sensitive child and I are going to Alice in Wonderland at the buck twenty five theater later today. My husband just finished his reading for the graduate medieval comps (Duns Scotus, Occam, etc.) and was last seen neck-deep in a student thesis.